Making sure your ukulele is in tune is one of the most important steps to playing ukulele, yet is often overlooked by many players. I’m amazed how many people either don’t know how to tune a ukulele or get up on stage to perform and their ukulele is out of tune. Nothing can kill a great performance as an out of tune ukulele. Do you struggle with tuning? No worries, I got you covered. 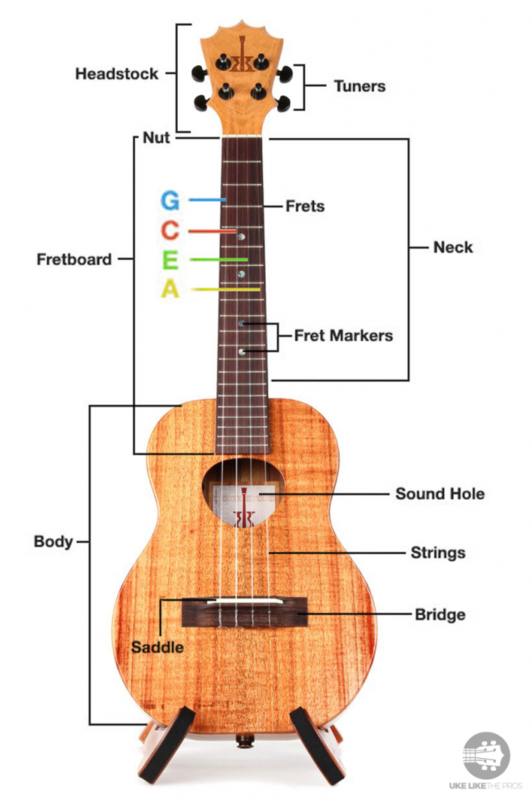 In this article and video, I will show you the 5 steps needed to proper tune your ukulele. Make Sure to Tune the Right Note. Let’s dive into each step a little bit deeper. To know your string names, first you must know what kind of ukulele you have. The most common ukuleles are the soprano, concert, and tenor ukuleles. The great thing about these 3 different sizes of ukuleles is that they all have the same string names. 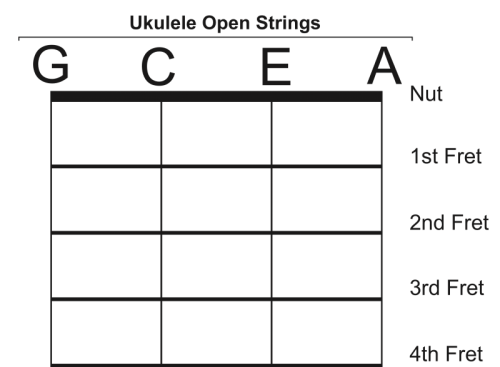 The string names for the soprano, concert, and tenor ukulele going from the 1st string (the string closest to the ground) to the 4th string (the string closest to your face) are A – E – C – G.
This will be the same whether you’re playing a ukulele with a high G or a low G.
For this article and video, we will focus on the tuning for a soprano, concert, or tenor. The 2 main ways to tune a ukulele are by ear and with a tuner. Although eventually you want to be able to tune your ukulele by ear, using a tuner is the quickest and most efficient thing to do. 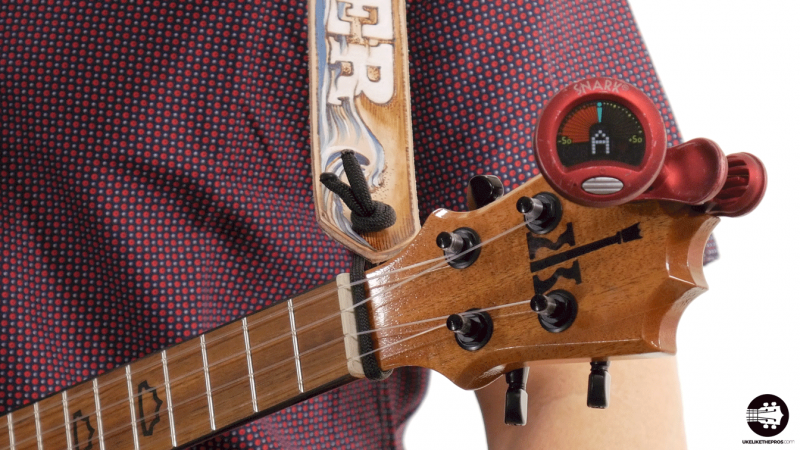 The 3 most popular tuners are clip-on tuners, ukulele tuning apps, or traditional hand held tuners. 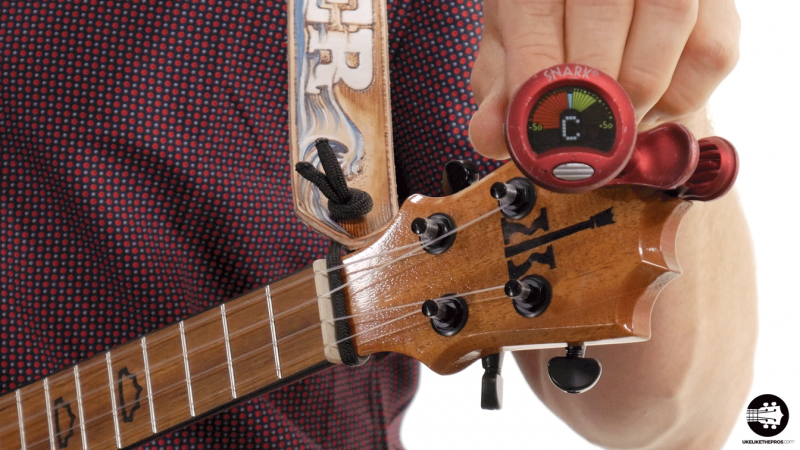 I use and recommend the clip-on tuners, like the ones made by Snark, because they are accurate and can tune using the strings vibrations, which is great if you are in a crowded or noisy place. Be wary of some of the free tuner apps, they are not always accurate. A good and free tuner app for iOS and Android is by GuitarTuna. 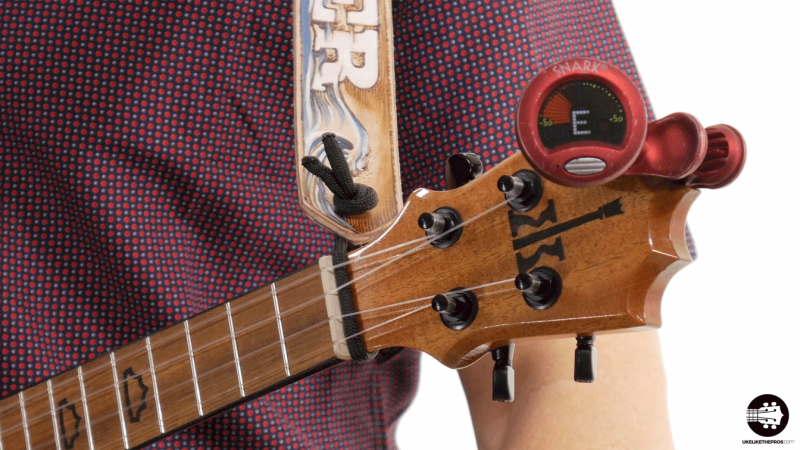 Having a tuner does no good unless you know how to use it. Knowing how to use it means knowing when a note is sharp, flat, or in tune. Flat is when a note is too low and needs to be raised up. When a note is flat the arrow on the tuner will go to the left of the note. Sharp is when a note is too high and needs to be lowered. When a note is sharp the arrow on the tuner will go to the right of the note. When a note is in tune the arrow of the tuner will go right to the center. Some tuners will beep when the note is in tune. If a note is flat (too low), then you must raise the pitch. For the 3rd and 4th strings, the tuning pegs on top of the headstock, turn the tuning pegs counter clock-wise to raise the pitch. Keep turning counter clock-wise until the arrow reaches the center of the screen. For the 1st and 2nd strings, the tuning pegs on the bottom of the headstock, turn the tuning pegs clockwise to raise the pitch. Keep turning clock-wise until the arrow reaches the center of the screen. If a note is sharp (too high), you must lower the pitch and will turn the tuning pegs opposite compared to when the note is flat. For the 3rd and 4th strings, the tuning pegs on top of the headstock, turn the tuning peg clock-wise to lower the pitch. For the 1st and 2nd strings, the tuning pegs on the bottom of the headstock, turn the tuning pegs clockwise to lower the pitch. The goal for each note whether it is sharp or flat is to get the arrow to the center of the screen. A common mistake is that people will use a tuner and think their ukulele is in tune, but it still sounds bad. This usually happens because they tuned the wrong note. When your tuning the 1st string, the “A” note, make sure the tuner says “A.” Sometimes people will tune the 1st string and get the arrow to the center of the display, but the note will read “Ab” or “A#” or “G” or “B.” If this happens, even though you think you tuned the note correctly, the ukulele will sound off. Another common mistake when using a tuner is that you are not tuning to 440 Hz. Although not every tuner can change the Hz frequency, but if you can then set it to 440 Hz and then tune up. Sometimes the handheld tuners, like the ones by Korg, make it too easy to change the Hz without even knowing about it. Although certain areas of the world will use something besides 440 Hz, it is a safe bet to start with 440 Hz and adjust if needed. 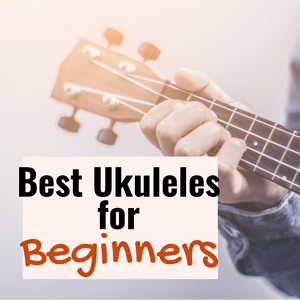 Tuning a ukulele is an easy thing to do, but it does require some knowledge and some practice. 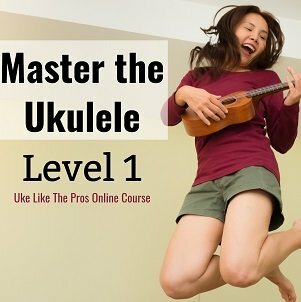 If you follow the 5 steps outlined and practice you will became quick and accurate at tuning your ukulele. Remember nothing can kill a great performance as bad as a ukulele that is out of tune. So, take a moment before you practice and perform and make sure your ukulele is in tune.